Orange is the New Awesome! Say “Hello” to the Orange Hub! Summer has officially wrapped up (and the recent snowfall in Edmonton has quickly reminded us of that!). 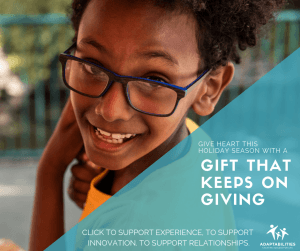 Now that Hearts in Action is over and Year Round Programming is back in full-swing, we want to introduce you to our newest location, the Orange Hub! At the beginning of November, AdaptAbilities will officially welcome our participants to the new facility. We can’t wait to welcome our families and our participants to this beautiful new space and spread our AdaptAbilities reach across the city of Edmonton. 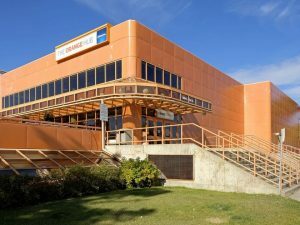 Formerly known as the MacEwan University West Campus, the Orange Hub is a centre for non-profit groups that offer programs and services in the arts, recreation, wellness and learning sectors. This accessible space will boast two classrooms for programming, including a Gross Motor & Snoezelen Room thanks to support from the Edmonton Community Foundation, a Sensory Room, thanks to support from the Children’s Ability Fund, and a classroom space that will mirror McKernan Centre. As AdaptAbilities continues to grow, we are excited about the opportunity to offer services in new areas of the city, in addition to our current spaces. The Orange Hub is a unique collaborative space that allowed us to expand into a currently underserved area of Edmonton. If you’re new to AdaptAbilities, please contact our Head Office at 780-431-8446 to set-up an intake meeting. If you are an existing AdaptAbilities family member, please fill out the form here. Activities are already underway in a temporary classroom – we can’t wait for you to see the new space! Who Else is at The Orange Hub? Sharing a space will allow for collaborative opportunities with other Edmonton businesses – a win-win! On Thursday, February 7 from 5 – 6:30 PM, AdaptAbilities will be hosting our Grand Opening event! Stay tuned to our social channels and blog for updates and registration. We can’t wait to see you there!